"Your favourite ALL INCLUSIVE hotel. Serving up the perfect holiday"
- Intimate, all-inclusive hotel in a charming town at the foot of the Alps. - A perfect retreat for guests of all types, whether you are after a gastronomic experience, a break outdoors or some 'wellness' pampering. - Ideal for families with children. While the children are entertained by our trained staff, the adults can relax in the hotel's thermal and adventurepools. - Recharge your batteries with some sport and exercise – play a game of tennis, squash, pool or table tennis, try your hand at mini-golf or bowling, or simply go for a session in the gym. - Explore the surroundings by renting a bike or doing some Nordic walking. - All in one place! Family wellness oasis in the middle of Bükfürdő with all-inclusive experiences. - Gastro Mania! Perfect choice with unlimited food and drinks, and kids' buffet. - Games, activities and relaxation! Enormous fun, enjoyable animation programmes from morning to evening for young and old! 200 air-conditioned rooms with bath, balcony, hair dryer, bathrobe, telephone, minibar, radio, Sat.-TV. Superior floor, connecting rooms, rooms for disabled guests and anti-allergy rooms. Car park, Internet corner, safe deposit box, free WiFi, laundry and dry cleaning, hotel taxi, souvenir shop, newsstand, library. 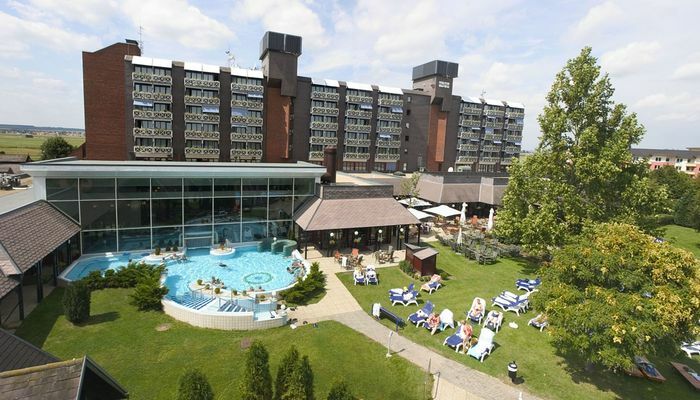 - Indoor thermal bath and swimming pool, outdoor swimming pool, Jacuzzi, steam room, sauna, part-indoor and part-outdoor adventure pool with massage showers, air showers, sofa, chess- and card-playing tables. - Garden, sunbathing area, solarium. - Emporium Wellness & Beauty: cosmetic treatments, massages, manicure, pedicure, hairdresser. - Use of all sports facilities included in room price. Nils Holgersson Restaurant with terrace, drinks bar in the lounge/lobby and garden. Hungarian and international cuisine, dietary dishes also served, wellness menu. The hotel offers 3 function rooms with seating capacity for up to 150. • All inclusive board is included in room rates. • The hotel is wheelchair accessible and features special rooms designed for wheelchair use. • Pets are allowed for an extra charge of 15 EUR per day. Guarantee policy: A credit card number is required to confirm or guarantee your reservation. Your credit card will be charged with the first night's amount at time of confirmation your reservation's. Cancellation policy: Regardless of whether or not the reservation is used, the amount prepaid is non refundable. The rooms are equipped with air-condition, bathroom, colour TV, Pay-TV, direct dial telephone, minibar, hairdryer, balcony and 220 V electric current. Connecting and non-smoking rooms, as well as rooms for disabled persons are provided.